For my first post I decided to start with my most recent project that I'm working on. 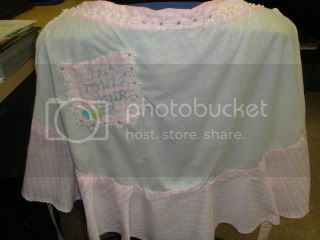 I'm currently involved in the third Tea Towel Tour on Craftster. I was in the second one as well. 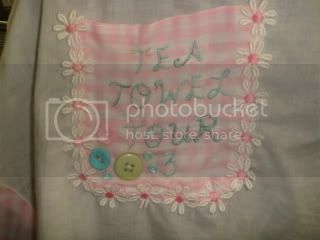 This time around I decided I wanted to make a very girly, sweet, retro-inspired apron for myself. I've been so involved in swaps on Craftster lately that I haven't had a chance to make anything for myself in a long while. So, I was extremely excited and went a little wild on this project lol. The white part of the apron, the part which my fellow craftsters will stitch on, is muslin; and the ruffles, waistband, and ties are pink and white gingham. On the pocket I just stitched the title of the tour.. sort of as a commemorative marking, and I added some sweet little vintage buttons. Then, I decided I wasn't quite finished until I added another personal touch to it. I've been looking at this towel from Antrhopologie for ages now and I've wanted it so badly but I just never am able to make it out to the store. So, I decided to do something like it on my apron. I think it turned it really well. 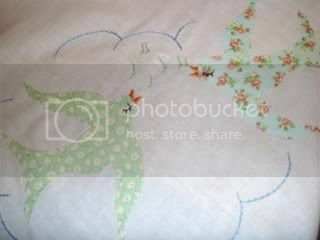 I was so nervous about doing appliques using the iron-on adhesive. I'd never done it before and it scared the living daylights out of me! I'm really happy with my apron so far! I'll be sure to post a final pic of it once everyone has had a chance to stitch on it.